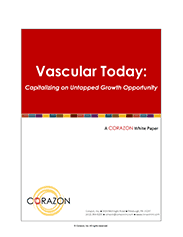 Learn more about the hottest topics in the HEART, VASCULAR, NEUROSCIENCE, SPINE, and ORTHOPEDIC specialties through Corazon-authored White Papers! Our team of experts distills vast amounts of research, along with clinical, business, and operational information into White Papers for our clients and colleagues to better understand what’s happening — what’s HOT — in our dynamic industry. 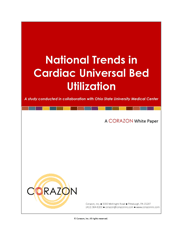 The cardiac universal bed (CUB) is a concept pioneered by Corazon that we’ve successfully implemented at multiple client sites. This progressive delivery model transforms the way cardiovascular care has been traditionally provided by maximizing hospital resources around patients, keeping them in one location from post-procedure until discharge. The CUB delivers the best of all worlds in terms of patient, family, physician, and staff satisfaction; clinical value; and efficient resource utilization. Corazon completed a research study on the CUB and has compiled the results into an impressive White Paper full of valuable information on this innovative practice. While the service (or product) line concept has existed for greater than six decades in other industries, only in the past 10-15 years has the healthcare sector begun to realize the great benefits in transitioning from compartmentalized ‘silos’ organized along departmental reporting lines to a more encompassing programmatic approach. The service line approach is best structured with primary (focused) care areas in a direct reporting relationship with centralized management. Some of the changes that have become necessary with recent healthcare reform initiatives only bolster the need for greater service line development. The service line concept has applications that are hospital-wide and can have significant impact on the operational and financial success of an organization. 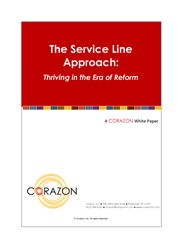 The service line model can differentiate a program while positioning it for long-term success, and has new implications due to healthcare reform. Learn more about this innovative management structure today! Indeed, the market for Vascular Services is expanding, with the number of programs nationwide increasing along with the aging of the population. In fact, vascular centers that address the full scope of patients’ care for patients with vascular disease, encompassing peripheral arterial disease, endovascular services, diabetes care, and stroke treatment, will be best positioned to take advantage of new revenue streams in the marketplace. Program development in hospitals has largely focused on growth in cardiac services. But systemic vascular disease—cerebrovascular, carotid, aortic, and peripheral vascular to name a few—is a growing concern, though many types remain under-diagnosed in the majority of the US population. This has huge connotations in developing a cardiovascular program that is cardiac and vascular—designed to meet the needs of both highly overlapping populations. Stroke continues to represent a major focus not only for front line care providers, but also for governmental health agencies, various regulatory bodies, pre-hospital providers, and many hospital leaders. Corazon believes it to be imperative that every organization be aware of the current clinical capabilities related to the care of stroke patients, AND the potential risks to any organization that has not made an integrated approach to acute stroke care a strategic priority. The realm of neurosciences is no longer in the exclusive purview of academic centers and larger tertiary centers. In fact, hospitals and health systems are beginning to realize that the opportunity to provide high-quality care to the stroke and full neuro population in a community setting is not only possible, but desirable as well. This White Paper details the expansion that took place at Corazon Client DePaul Medical Center, part of the Bon Secours Virginia Health System, located in Norfolk. With the proper analysis, expertise, and planning, a full scope of neurosciences can be offered by any hospital or system provider willing to invest time and resources into advanced care of this complex patient population. This White Paper offers a comprehensive look into this process and provides insight into the extraordinary success realized by DePaul Medical Center. Want to better understand what's happening in our dynamic industry? Contact us or visit our shop to request one of our White Papers today! Disclaimer: Please note that Corazon White Papers are intended for individuals affiliated with hospitals, health systems, physician practices, and other healthcare delivery organizations. We apologize for any inconvenience.